One thing has stayed consistent throughout John Petrucci’s long and successful career: the DiMarzio® pickups in his guitars. John has been pushing the envelope of progressive metal since the late eighties, and the DiMarzio® LiquiFire 7™ Neck Model resulted from our most recent collaboration with John. He used it throughout Dream Theater’s tenth studio album, “Black Clouds & Silver Linings”. John swears this is the best live and studio sound he has ever had. He wanted a neck pickup with a flowing, singing solo tone when used with a heavily overdriven amp and a clear chord sound with a clean amp setting. The sound John likes in the neck position of his 6-string translates very well to the 7-string, with fat highs and clean lows for smooth solos and tight bass lines. 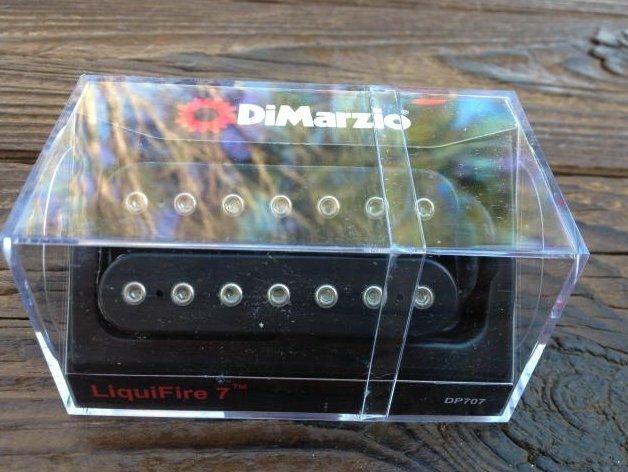 The LiquiFire 7™ isn’t an exact duplicate of the 6-string version. The attack is a little more focused and the voicing is shifted down about 500Hz to bring out the sound of the seventh string.